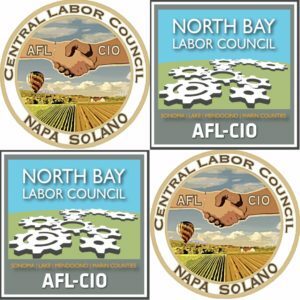 This disaster relief fund has been set up to assist affiliated active or retired union members who have lost their homes or been evacuated by the devastating fires that have affected both the North Bay and Napa Solano areas. 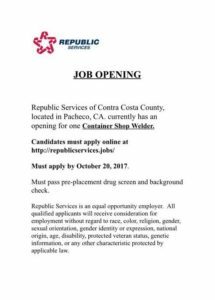 Republic Services is hiring for a Container Shop Welder in Pacheco! 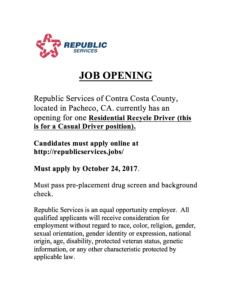 Deadline is October 20th. 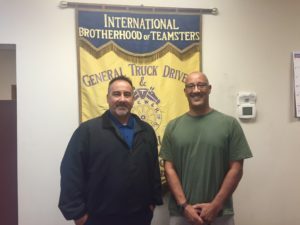 In a contract vote led by Secretary-Treasurer Don E. Garcia, Business Agent Dustin Baumbach, and Steward Daniel Melgoza, Teamsters for Recology Vacaville introduces retirement medical coverage to their newly ratified 7 year contract! 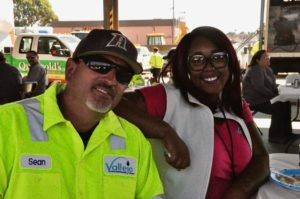 The Teamsters of the Vallejo Sanitation and Flood Control partake in Health and Safety Day followed by a BBQ. 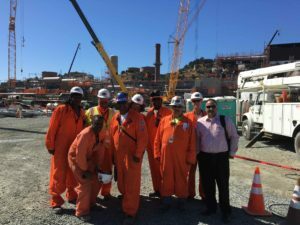 “300 volunteers strong. Over 20 different unions. 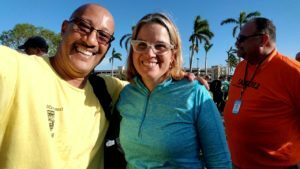 Covering truckers transportation, medical, and construction unions.” 315 member Tim Davenports updates us on his first day in Puerto Rico. Secretary-Treasurer Don E. Garcia and President Alberto Ruiz celebrate our Cherne Teamsters at a Member Appreciation luncheon. 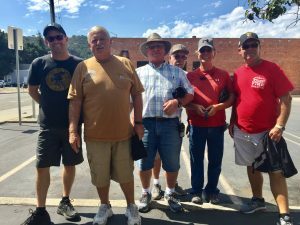 Tim Davenport, a UPS North Bay driver from the feeder department, is flying to Puerto Rico this Wednesday to assist in relief efforts, driving big rigs and transporting goods during this time of emergency. 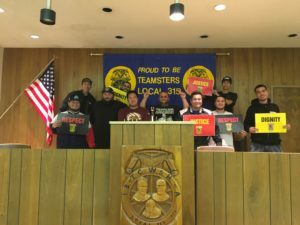 Local 315 thanks you, Teamster brothers and sisters, for your time to help out during these difficult and unbearable times for the Hurricane Maria victims. 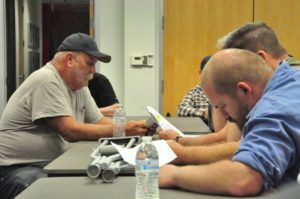 El Cerrito Honda gathers for a proposal meeting in preparations for upcoming negotiations alongside Business Agent John Bottali. We surprise visited our brothers on the set of Netflix Series 13 Reasons Why with Teamster shirts. Each Teamster drives a truck of specific set equipment such as strips, electrical, greens (tree props), etc. They load, unload, and get a sneak peek of the show.